With more than two decades in the executive MBA space, Julianna Sowash has a deep understanding of the challenges and opportunities experienced by mid- and senior-level professionals pursuing their MBAs while continuing to lead full time. She is passionate about providing a transformational experience for graduate students to enhance their leadership skills and open doors to new opportunities. She is proud to work with so many outstanding students, alumni, faculty and staff. Thanks to more than 20 years of engagement with the region’s business community and more than 1,000 Oregon Executive MBA alumni, Sowash serves as an anchor to the program’s community. Sowash took on the executive director role at the Oregon Executive MBA program in 1995. Prior to that, she managed the corporate and professional programs at the University of San Diego. In 2010, Sowash took a brief hiatus from the University of Oregon to work in a start-up. 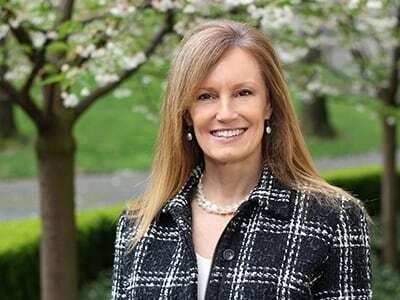 She returned to the Oregon Executive MBA as the director of marketing and executive admissions in 2013 and resumed the executive director role in the spring of 2017. She is proud to note that Oregon Executive MBA’s cohorts are consistently higher than the national benchmarks for years of work and management experience, income, and percentage of women students. Sowash earned her bachelor’s degree at Oregon State University and her MBA at the University of San Diego. On the weekends, you can usually find her riding one of her horses on the trail. On Saturday, June 16, the Oregon Executive MBA celebrated the graduation of its 32nd class. Gudrun Granholm is the new capstone coordinator at the University of Oregon's Portland-based executive MBA program. Changes in Oregon Executive MBA's leadership leave the program poised for continuing success. A new sustainable building in Portland now houses the Oregon Executive MBA and the Sports Product Management programs. Portland Business Journal recognized the accomplishments of Sam Blackman, MBA '08, and Joe Robertson, MBA '98.